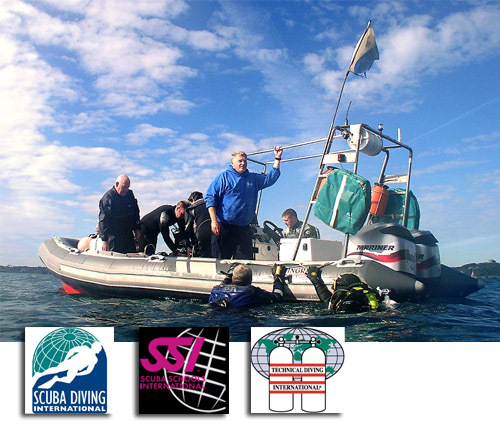 Atlantic Scuba offer Diving courses and guided Dives around Falmouth Bay and the Manacles Reef, Just off of the Lizard Peninsula Coast at St Keverne. Our Dive boat is moored on the Fal Estuary, at Mylor harbour - giving easy access to Falmouth Bay and the Manacles Reef. At our dive school, we offer a full range of Diving courses (SDI), including Scuba Schools International (SSI) courses and Professional Scuba Association International courses (PSAI). Most of our dives are around Falmouth Bay and the Manacles. We have years of Diving experience around the whole Cornish Coastline. With knowledge and experience of some of the best Cornish dive sites from Padstow in North Cornwall to Plymouth and Plymouth Sound. Atlantic Scuba offer escorted dives for qualified divers around the coast of Cornwall - Diving in Cornwall and some of the best dive sites not just in the Falmouth area. If you have never dived before, try the Scuba Discovery Course (Try Dive), so you can see if you like it. Our RHIB 'Stingray' is an MCA Category 4 coded 6.3m RHIB. you can charter Stingray to fery you to dive sites around Falmouth Bay or for pleasure trips and wildlife cruises seal watching trips. Stingray is capable of carrying up to 10 passengers up to 20 miles from port. Diving in Cornwall at its best.